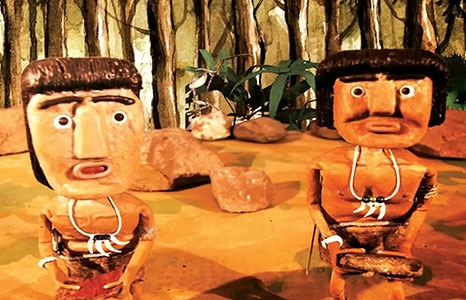 The Sunday program brings together short animated films from Chinese, Hawaiian, Indian, Jamaican, Korean, Māori, and Native American cultures. Interact with exhibits and vendors from Kottura, Mana Comics, Keiki Coding, Hawaii Women in Filmmaking, and Bess Press. Directed by Thomas Bozovic, Alexandre Cazals, Julien Legay, Chao Ma. 2013. Chinese. 7 min. In the heart of ancient China, two brothers are hunting a fox. This mad journey will have them face treason, bravery, hatred and love. Directed and animated by Brenda Bulut, Thomas Campos, Théo Coriton, Marion Debrick, Nina Gannier, Antoine Gillet, Alix Putier and Clémentine Sergeant. 2017. Native American. 4 min. Directed by Judy Choi. 2018. Korean. 3 min. Hawai‘i premiere. Directed by Kari Noe. 2018. Hawaiian. 1 min. Directed by Moe Johnson. 2018. Korean. 6 min. A National History Day animated documentary about the division of Korea. Directed by Penelope O. 2018. Hawaiian. 2 min. World premiere. Pete is getting bullied. Some friends step in to help him stand up against bullies. Through Keiki Coding, students are introduced to the principles of video game creation, game logic, proficiency and computer skills. Each progressive module is filled with original content and artwork that is created to specifically fit the needs of local students in Hawai’i. Twiddle Productions's special place-based curriculum and talk story sessions with artists, animators, and game designers guide Keiki in learning how to bring their amazing ideas to life and spark their imagination by becoming a coder! Directed by Naila W. 2018. Hawaiian. 2 min. Hawai‘i premiere. 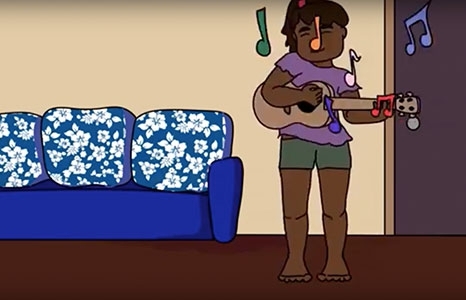 This original poem, "My Day" was written by 9-year-old Naila W. for the 2018 Honolulu District Speech Festival. Created by Luciano Blotta and Twiddle Productions Inc. 2014. Jamaican. 3 min. Created by Charlie Beakley, Rodney Selby, Matthew Rogers, Ray Ruawhere, and Karl Johnstone. 2006. New Zealand. 6 min. Directed by Tara Douglas. 2017. India. 38 min. Hawai‘i premiere. The Tales of the Tribes is the first collection of animated indigenous folktales to be produced in India in collaborations between traditional and digital artists. There are five short films in the collection which are adaptations of indigenous Indian stories: tales of mythical origins, tales of Humankind’s interdependence with nature and the supernatural; tales of local heroes, landscapes and events. Directed by Rosemary Kulhavy-Sutherland. 2017. Hawaiian. 1 min.